Key West, FL sets new subzero "record low" temperature – Update: now snowing! | Watts Up With That? Key West, FL sets new subzero "record low" temperature – Update: now snowing! OK fun aside, this is obviously another ASOS thermohygrometer malfunction, but one in the opposite direction that we usually see. But, there’s an interesting twist here that will provide a useful test of the integrity of data handling policy within NOAA/NWS. Please read on. Here is what our offending ASOS in Key West looks like. It was recently surveyed on 6/1/2009 and was the last USHCN station surveyed in Florida to complete the USHCN state survey. Early in June, there was an incident in Honolulu International Airport where the ASOS station there malfunctioned and it set a string of new high temperature records for Honolulu. Those records still stand for Honolulu despite protest even though it was clear that fixing the ASOS sensor dropped the temperature dramatically and immediately. 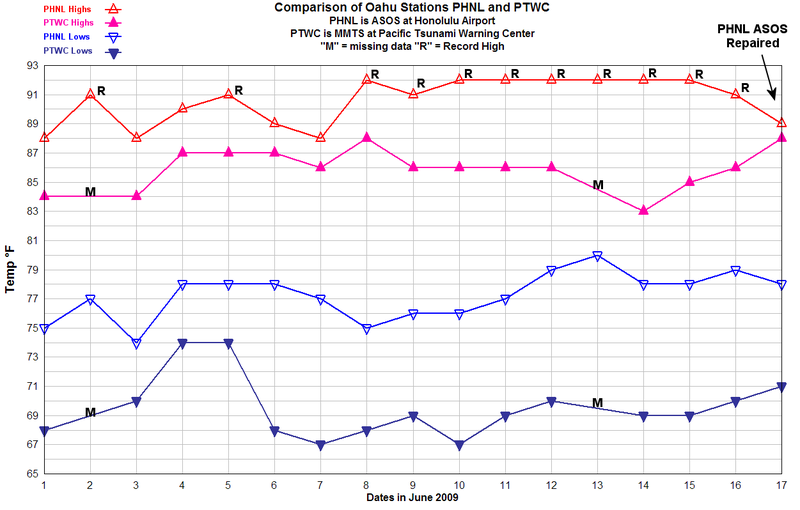 I did an analysis at the time comparing PHNL to another COOP station just four miles away. The differences were obvious. So now the question is, we have another obvious malfunction, but in the opposite direction. Will NOAA keep this new “record low” which like the Honolulu record highs a fault of a ASOS equipment failure? Or, will they throw it out? To be consistent with the Honolulu decision they would naturally keep it, though in both cases, logic dictates the data should be thrown out. A big WUWT hat tip to Corky Boyd for this one. UPDATE: Either the sensor has started working again on its own, or has been repaired. However there’s something still not quite right as it is now apparently snowing at 9:53 AM in Key West. 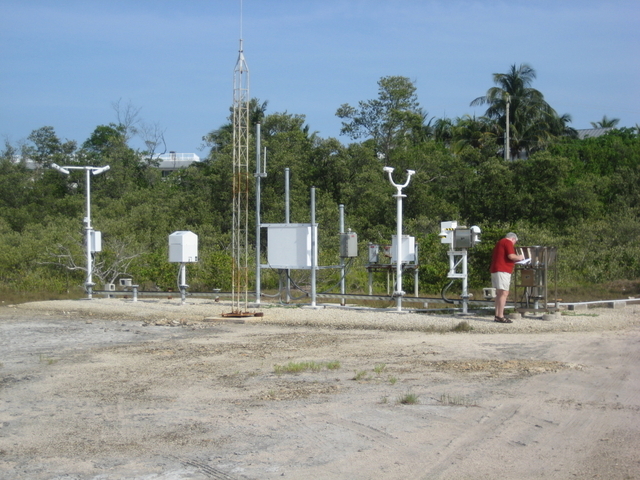 July 11, 2009 in Climate data, Weather_stations. I have spent my life working on electronics. Things fail. I would not trust a reading from a single sensor, particularly if it is 5 or more years old. I would feel a lot better if they put an array of three sensors and raw data included the output of all three. If they are all within some agreed tolerance, then the average of the three is the reported temperature. I thought it was a bit nippy when I stepped outside! Hopefully it will get rid of all those pesky iguanas down here. Don’t you just love this one? It is note worthy because of the semi-official response to the Honolulu incident. Obviously, they cannot correct the Key West data without making the earlier ‘no legal authority”- (insert rest of bs here) twaddle even more ridiculous. What a hoot! Today was a beautiful fall day here in Silicon Valley, California. It started off a bit cold at 55F on the patio at 8am, but by noon was warmer. Unfortunately, at 1 pm we had sprinkles. Now, there are 2 weeks in mid August where we rarely, but sometimes, have a bit of rain. Occasionally even a thundershower. Typically followed by an “indian summer” until Halloween. In 25 years or so I can remember exactly one halloween where we were rained out (and another where sprinkles ended “Just In Time” for the kids to trick-or-treat… So this fit the mold of a wonderful fall day. It didn’t rain and the clouds turned to scattered cloud late in the afternoon. Never got too hot (I’d guess it was about 78 F max). It did turn back into overcast at the end of the day and now, at a little after 11 pm we’re back to 59F on the patio and headed lower into the night. All it all a fine and typical fall day. One Small Problem: It’s the middle of Summer. July 11 is “supposed” to be 90 something with a chance of a sporadic 100 F maybe dropping to a comfortable 80 something at night with a hope of the occasional 70 something at 2 am so you can cool off enough to sleep. While I agree that the temperature recording and reporting system is full of failures, and it IS an interesting question what they will do with the obviously wrong low in Florida, given the history… The fact is that there is something big forming. It is not happening fast, but it is happening. We are getting “way cold” temperatures from places all over the planet and if the trend continues it is “not good”… and there is every indication that the trend is continuing. Everyone is wishing and hoping that it’s just cool enough to spike AGW as a thesis. Everyone is whistling past the graveyard here. We have kids dying in Peru from cold, Argentina talking about stopping ALL wheat exports, Australia and New Zealand opening ski season early, Canada having a reduction in wheat yield due to anomalous cold weather, snow in the middle of summer in places that ought not to have it. Look, it’s getting cold. Now. Yes, it is a slow “boil the frog” approach of cold, but are we really no smarter than frogs? Apparently, they are no longer logging measurements from Key West- it shows N/A for the last two data passes. Copy that report and send it straight to Congress. But make sure their medical staff is on full alert. Somebody’s bound to die laughing. Send it it to the NY Times. If the vegatation around the ASOS is dead, the problem is more serious than the more likely cause of instrument failure. So, dispensing with any rips in the space/time continuum, bet if the instrument failure was for temps in the other direction (record highs), it would probably take several days to catch on – but the data would remain, as it was in Hawaii. From the tempertate region of Greece, we are also getting weather appropriate for September and not for July : cool nights, livable days. July is the month we hit 40C for a few days. If it is sporadic we are happy, if it lasts for more than three days it is heat wave. This year it is an airconditioned summer, barely over 37C some days and below 30C for most. It has happened before sometime in the 90s. Well, now it shows N/A for the last three data passes. Seems as though NOAA pays attention to your blog. Everyone keeps complaining that these guys don’t do quality control- but why should they? You do it for free…. E M Smith: Same here in England. The Met Office forecast a ‘BBQ Summer’. After a few warm days for Wimbledon (when the government warned us repeatedly of the dangers to our health of this beautiful and warm weather), we are now told that the jet stream has moved to its autumn position and is bringing us cool and wet weather, with no chnage in sight. With all that stimulus money out there that has yet to find a home in the pocket of one of the Dem’s contributors, there should be quite a nice business opportunity here for an intrepid entrepreneur like yourself. A quick scout through your Weather Shop site indicates that you could supply a Davis VantagePro2 Plus with all available bells and whistles for each of the 1221 USHCN sites for about $2 million plus, of course, installation and administration costs. After adding in the usual $500 hammer federal price escalator, I would suggest an initial bid proposal in the $50 million range which, after the usual unforseen difficulties justify the mandatory 100% federal contract overrun, should yield you about $100 mil gross. Given your leading role in the Surfacestations Project, I’m sure there will be some who may accuse you of taking advantage of a situation that you yourself created, but hey, if it’s good enough for Algore and all his alarmist brohiems, it ought to be good enough for you as well. The only real problem will be in generating the initial $250,000 in capital for the political contributions necessary to get the project off the ground but, given the now thoroughly established return on equity ratio for political contributions, you should have no difficulty convincing a banker to front you the money. As to my own creative contributions to the enterprise, I’m willing to leave it to your discretion, but I think 5% of the gross seems fair. Funny that. The security cameras in city centres never seem to work when organizers of protest marches request footage after the event to calculate attendance numbers either. crosspatch – you are not seriously suggesting a consensus approach, are you? You have learnt nothing here…………. I think I have finally figured out how global warming came to be: TMI and mankind’s need for worth (be it through power or benevolence or both). A side note…why does mankind always see the end happening with flames and fire….why never cold and freezing? Is it because mankind flourished in temperate climates and peak heat was more uncomfortable than the experienced cold? The amount of time and energy wasted on this issue is mind boggling. Just think of all of the real productiveness that has been wasted, lost forever. We (“skeptics”) do it in the name of truth and liberty. AGW does it in the name of control and global governance. It feels like we are in a really bad sci-fi movie or an episode of the twilight zone. Used to be that you could “complain about the weather, but there was nothing you could do about it”. Now in our self aggrandizement, we say that, yes, we can do something about the weather…but it’s gonna cost ya…and though there is no way to measure what we do to change the weather…we have computer models that tell us what is truth. I have nothing against monitoring the weather. I took my job in the Air Force doing just that very seriously. But I never in my wildest dreams thought that my data collection would be used for this. This episode in American and world history has really challenged what kind of future we are giving our posterity. I hope Anthony doesn’t mind me venting on his weblog, I chose an article that I figure won’t get as many visitors as the other excellent articles he makes us aware of. I would have posted it over on climatechange but all 17 people there might not get to see it before it would get erased. I live in NE Pennsylvania and this is the coldest summer I can ever remember in my lifetime. National Weather Service data from Central Park, NYC just 2 hours away proves me right. It was the coolest June since 1958 and the eight coolest on record. ( the late 1800’s). Here we are in mid-July and that trend has likely worsened because the past two weeks have been cold and the forecast shows another cool week on the way. Yet I look up in the sky and realize that the greenhouse blanket of CO2 is ever present. It has increased from 3.15 to 3.85 parts per 10,000 since 1960. We have 2/3rds more of a CO2 molecule per 10,000 molecules of atmosphere. Of course natural variability is now in charge of thing way up in the sky. Our entire climate history was “natural variability” except for the 20 yr period from about 1978 to 1998. They take us for CHUMPS! I’ve noticed that some of the leaves have started to turn already. The temperature is hardly “barbecue” and the rain is heavy and frequent. I wonder what the Met Office and “Deep Black” has to say about that? Sorry I know this is off topic. Tim B looking at that Peter Sissons article it includes this quote.. The fact is that there is almost no real work, i.e. published science, being produced by reputable scientists and climatologists that contradicts the concensus position on global warming. Richard, that depends who gets to define “reputable” and who chooses what gets published. So then, my question is just this: If that sensor has been behaving as erratically as is revealed by the record, will the whole record be considered in question? When I was serving in the USN as a Calibration Tech (metrology), and a calibration standard evinced such erratic behavior, then all of the test instruments which had been calibrated using that standard would be recalled for evaluation to determine whether their accuracy had been affected. If the NOAA decides to keep the high temperatures while tossing the low temperatures, then they will have introduced an unknown error into their records. Doing such would be beyond the pale of crass dishonesty. Please be carful with those headlines. For 10 seconds, I though that Florida had been saved from invasive tropical species. Define it as you will. I take it you are agreeing that there is almost no published science that contradicts the concensus position. Robert Frost said it best. Thie poem is amazingly apropos. I’ve noticed that some of the leaves have started to turn already. The temperature is hardly “barbecue” and the rain is heavy and frequent. In sunny Gloucestershire its another warm sunny day, showers and cool for last 2 days but back to typicalearly july weather. Have used 1500litres of collected rainwater on garden and only 500l remain. Although I do find interesting the references to unusually cool events, I do think it would be appropriate to also discuss the current hot spell in Texas. I am sure that I am one of many who use this blog as a major source of information on what is happening in the world of weather & climate. Well that should seriously help the Frozen Orange Juice industry that is a mainstay of the Florida economy. Perhaps you could start by providing a link to the published science that demonstrates that mankind’s contribution of CO2 to the atmosphere is a major driver of global climate. There has been plenty of published work based on the -assumption- that that’s the case (e.g. the entire IPCC project), but I’ve never seen a published study that actually proves that mankind’s CO2 caused the ~1 C per century warming. I assume it was sometime around or before 1988 when Hansen gave his sworn scientific testimony before congress that mankind’s CO2 was doing this. But I’ve never seen the published study that he was basing this on. Someone at the airport should have noticed the problem. Notice that the first line is an automatic report (AUTO), the others are manual reports, one has even a correction although I can’t see what is corrected. for thos who don know how to decode this: 32/23 means temp 32C dewpoint 23C; M33/ means temp -33C, no dewpoint. You are wrong sir. There are many many publications refuting the “consensus” alarmism:” CO2 is a pollutant and the sky is falling” Go to the skeptics links on the side bar to find them, because it is not worth my effort to do it for you. I’m in Texas, Inquirer, so I got me a front row seat. This summer, there’s almost no rain – in places like South Texas, there is no rain, period. They’re getting the winds straight off the Chihuahuan desert to the immediate southwest (rather than moisture from the gulf) and as long as those macro wind patterns hold, there will be no rain. And when there’s no rain, the land just bakes in the sun day after day and the temps go up and stay up, day after day, week after week. That’s what’s “normal” without rain. the first time this has happened – people are starting to wonder whether this will look like the great drought of the 50’s, when there was very little rain in Texas for 7 years running and most of the agricultural and ranching industries were wiped out. Yes, it could be happening again – only time will tell. It is difficult to have a discussion when you define the terms such that what you read and believe is produced by reputable scientists and climatologists and what I read is produced by crackpots and charlatans. So I’ll just mention that I think there is a lot of good science being done but much of it is tainted by association with the UN and other folks pushing for one world government without liberty. If we could remove this issue from the climate science I think the level of discussion would improve. Meanwhile, some of us have hard-drives crammed with interesting articles questioning and even refuting the AGW hypothesis. It only takes one. Why we save more than one is another issue. Like the the old saw, “correlation doesn’t equal causation”, we can add a new one: “consensus doesn’t equal causation”. The chaotic complexity of climate has been chipped away at, but we are nowhere near an understanding of its complexity. We’re getting better at sorting out microclimates, but the science of AGW is still a hodgepodge of antecdotes. The “consensus” is a religion, not a body of fact. The above link to the NOAA page for Key West Airport says “Light snow” in the Weather column. Temperature is NA. BTW, we were 9C/48F in the Great Lakes region this morning. About 20F below typical for the middle of July. It’s saying “light snow” for 9:53 AM. It looks to me like the wind speed and direction have been “corrected.” Then next the “COR” is resent without the “COR.” This seems strange to me, but maybe it was part of a panic attack! One wonders if the correction is to a manual reading error, or to instrument malfunction. Whoops – I didn’t look far enough — getting old I guess. The temperature, altimeter, fahrenheit temperature, and sea level pressure groups are also changed. Richard Sanders said: The fact is that there is almost no real work, i.e. published science, being produced by reputable scientists and climatologists that contradicts the concensus position on global warming. First, you are wrong. Have you even tried looking? I highly doubt it. “I regard consensus science as an extremely pernicious development that ought to be stopped cold in its tracks. Historically, the claim of consensus has been the first refuge of scoundrels; it is a way to avoid debate by claiming that the matter is already settled. Whenever you hear the consensus of scientists agrees on something or other, reach for your wallet, because you’re being had. Don’t look now, but your highly-cherished “consensus” is in the process of being undermined and overturned. Hopefully, before a great deal of financial and social damage is done, but the harm that has been done to science itself is incalculable. Only 5% ? Come on man , we’re talking government money here . Besides , this project should be worth at least 100 mil . Whether its a malfunctioning sensor or UHI, i think the scientist charged with maintaining the temperature record have put too much faith in their ability to adjust for such issues. From the article regarding the use of raw satellite data to the continuous tampering with historical temperature records it should be blatantly apparent that either the scientist involved have an agenda or they feel simply recording, compliling, and reporting raw data isn’t a sufficient task to meet the needs of their egos. Sanders, you are embarassingly wrong. This isn’t the realclimate echo chamber, where you can throw out a provably wrong statement like that without danger of it being refuted. Are observed changes in the concentration of carbon dioxide in the atmosphere really dangerous? Does human activity widen the tropics? – Modeling climatic effects of anthropogenic carbon dioxide emissions: unknowns and uncertainties. Reply to Karoly et al. On global forces of nature driving the Earth’s climate. Are humans involved? The IPCC future projections: are they plausible? Looks like they ignored the ‘record’. Hmmmm – Light snow in Key West? Mister Sanders can’t even spell consensus! Well, let’s see, I have a little problem with his statements-when referring to the “consensus” he is vague-what is the consensus he refers to? Is it that there has been some warming? If so, I suppose he is right-but the mere presence of change is neither proof of AGW nor cause for alarm. Is it that human beings must have some effect? Again, he would be right, however this is again a qualitative statement and the basic agreement is hardly cause for alarm and allows for a trivial influence. Perhaps he refers to the curious IPCC statement “Most of the observed warming since the mid-20th century is very likely [90% probability] due to observed increases in anthropogenic greenhouse gas concentrations”. Well, here it becomes tricky. This allows for a 10% probability that anywhere from 0 to 50% is the actual human effect, and 90% probability that it is greater than 50%. There is nothing especially objectionable about this. After all, we are talking about fractions of fractions of a degree. Alarm, in fact, demands that something like 250% of the warming be due to greenhouse gases-now, obviously one needs something to cancel out the rest but the parameter of choice, aerosols, is so uncertain as to render the entire exercise a farce. All of these points are STILL tangential to the question of policy and impacts, but by that point one is multiplying so many probability figures in the chain of inferences that the numbers you are looking at are tiny-so who gives a hoot? That besides the point, apart from some trivial points of agreement, the literature is chock full of dissenting voices on every issue. So mister Sanders, I would be prepared to create an extensive list of references to papers which, in one way or another, contradict alarm-how many would it take to satisfy you? Smokey would you say the science is settled? There is no antrho component in climate? And anyone who says otherwise just wants grant money or is somehow involved in a great conspiracy? I mean, you seem pretty certain in your views, and based on the majority of comments about the motives of the “warmists” there seems to be only once explanation of how they could come to these conclusions. I just want to make sure I have this right. I take it you are agreeing that there is almost no published science that contradicts the concensus [sic] position. When you abdicate observation for “published science,” and continued understanding for “consensus,” you’ve abandoned science and embraced politics. There is no amount of ad hom, arm waving, or shouting down that can change this simple fact. Anthony: Looking at your first illustration, it doesn’t appear NOAA is even able to translate Zulu time on the observations to EDT correctly. I believe the difference to be 5hrs. The first tabular chart shows the same problem compared to the raw data. I’m in the CDT Zone and I use 6hrs to convert. AH HA! I knew the water temp in the Gulf was lower this morning. I could tell it was in the 84-85 degree range rather than the usual 88-89 degrees for this time of year! At the risk of being accused of stating the obvious, I would like to take this opportunity to remind everyone of 2 things related to the comments up thread about the climate being a chaotic system, and probability statements. 1. The climate is only one of many chaotic systems that interact with each other in ways that we have yet to discover. These include everything from biological, geographical and hydrologic to solar/lunar, financial, and sociological. Climate cannot be treated as a system that is isolated from all others, although that is often what is attempted. 2. Probability statements say far more about the state of our knowledge (or ignorance ) of any given system than they do about the system itself. Well, it really is piling on at this point. But Richard should know that statements such as his, that get a complete pass at alarmist sites – won’t do so here. And it’s a wholly fallacious argument to claim an ideological bottleneck on “publishing” comprises the science universe. One of the founding reasons for the internet was to allow scientists from disconnected disciplines to share their data. The AGW campaign has managed to undermine the good reputation of journal publications. Were they fair or balanced, they would have published many more skeptic studies. Fortunately, total control of one publishing channel in an internet savvy world – provides little strategic advantage. All joking aside we haven’t had a really cool July so far here in Kansas, because our state sits a few hundred miles north of Texas at most where that state is at the center of the high pressure ridge. North Korean hackers worming their way into NOAA? Benjamin P. (09:55:42) : There are apparently subtleties which it is hard to get warmists to understand. Nobody says there is no anthro effect-that’s a strawman, because the real argument is much harder to deal with. It would matter if there was a “consensus” in that direction anyway. So here again: THE MERE PRESENCE OF SOME CHANGE AND THAT SOME COMPONENT OF THE CHANGE IS ANTHROPOGENIC DOES NOT JUSTIFY ALARM. As for conspiracy-how is acting in one’s own self interest-seeking grant money-in anyway a conspiracy? Apparently the Invisible Hand is also one giant conspiracy theory, to. What kook that Smith guy was, eh? Darwin too for that matter! But the association of dissent with “conspiracy theories” is part of a argument from ridicule-which is right out of Rules for Radicals so I suppose not too surprising. It has been addressed by myself already, however i would note that the real conspiracy theory is on the other side (some clear projection here) where dissent is alleged to result purely from some sort of anti-science cabal of industry and the like. Now who is whacko? There has been some warming. Human emissions of greenhouse gases have cause the concentrations of such stages to change. In particular, there is a rise in CO2 which must result in some warming, because the physics of such greenhouse gases demand it. Without knowing how clouds and water vapor respond to small changes in temperature, we cannot know how much warming said increases would actually lead to. So models are used to create some best guesses BUT MODELS ARE WOEFULLY INADEQUATE AT DEALING WITH CLOUDS. Nevertheless models tend to indicate rather “large” amounts of warming from speculative future changes in CO2 etc. EVERYONE who is anyone agrees with these basic points. BUT NONE OF THESE STATEMENTS ARE QUANTITATIVE. He who refuses to do mathematics is doomed to talk nonsense, and as long as the “consensus” is on such trivial, non qualitative matters, it is not really worth anything. IF THE NUMBERS WE GET IN THE END ARE SMALL, ALARM IS BASELESS-can’t be stressed enough. And increasingly it looks like the numbers are indicating a very small impact of GHG’s. There is far from a consensus on that matter (some vehemently insist that the big effects must be right) but it only takes one person looking at the right observations carefully to show where they have all gone wrong. And we have plenty of people who have found exactly where the catastrophists are dead wrong. That they are reluctant to back down is only evidence that they have painted themselves into a corner, or that they are unfortunately not bright enough to understand the best analyses-hardly conspiracy. More like stupidity and basic survival instinct. 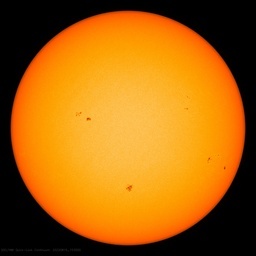 It is easy to explain the reason for the snowfall and cold temps in FL in July: the 24th cycle sunspots that poked up their heads to the shrill of clarions and jingle of timbrels have been hauled away in tumbrels to have their heads chopped off. We know that GW is a fact, there has been warming (in the past, i am not so sure anymore about recent years). A in AGW is a factor. We know that it can’t be 1 because that would attribute all warming to a human cause wich is not true and is even admitted by the IPCC for not being true, we also know that the factor A must be larger than 0 because we must have some influence. The question is how large is this factor A? The other question is, how good are the models that predict the future based upon the current GW with that component A? My guess is that those models are rather poor and that a lot more needs to be done before we even should thinking about raising taxes and setting up trade-schemes because mother nature needs to be rescued from those nasty humans. It seems the Peter Sissons article on the British Bucket Company has gone missing. I wonder why. Yes, that is the important question. And the main culprit in global warming has been identified by the alarmists: they say it is carbon dioxide. As it turns out, they are wrong. And if the effect of increasing CO2 is too small to measure, then it can be safely disregarded. The alarmists are wrong about CO2’s effect, which is negligible. The imperfect model of a modern, major modeller. Polyphemus (Our Enemy, The State) had one eye, until ….. it was blinded by Odysseus. OTTAWA – Federal weather forecasters were blind to a vicious snowstorm that stranded 1,500 vehicles in Nova Scotia last fall because every one of their computer models failed to predict it, says an internal report. Instead, staff at the Atlantic Storm Prediction Centre had to rely on telephone calls and emails from colleagues and friends to find out what was going on. The “models did not predict anything resembling the north-south oriented band of heavy precipitation over the affected areas,” says the report, obtained by The Canadian Press under the Access to Information Act. It’s more like a fad. Academia is full of them, due to its high proportion of academia nuts. Now it seems that NOAA has interpreted FZRANO in METAR reports from KEYW as Light Snow. I believe it means Freezing Rain, not light snow. Maybe they need to do some work on their METAR decoders! You are comparing the wrong lines. The newest report is on top. 111953Z is the date and time of the report, the 11th at 19:53 hrs UTC. There are 2 reports for that time of which one is the COR. I thought I felt a lurch last night. I guess it was just the earth heeling over. No cause for alarm. I wonder if the Catlin Expedition to map the ice around Key West is all good to go for next year. Again, the snow is alos in a (manual) METAR, again corrected but not for the snow. So the snow comes probably not from clouds (few is > 2/8). The visibility in the decoding should be 1 3/4 Status Miles. Uh… I forgot. Obviously the Catlin Expedition to Key West will only be mapping first year ice. You are exactly right — I must be getting cross-eyed in my old age and was looking somewhere else. And I have been reading METAR code for probably as long as METAR has been around. Thanks for keeping me straight. I’ve been telling my wife that my mind used to be like a a steel trap but now it is more like an old coffee filter, and all the good stuff just runs on through. Of course the science is not settled. Climate science is very new. The only thing I am relatively certain of is that the alarmists have attributed a huge influence — almost total influence — to the putative warming effect of CO2. In fact, they have staked their entire argument on CO2; “carbon.” Now they’re stuck. Because it was always the alarmists who stated that “the science is settled.” Skeptics have simply questioned their arrogant certainty that CO2 is almost entirely at fault. But at current levels, the warming effect of CO2 is so small that it is not empirically measurable in the real world. All the “evidence” comes from GCMs. That is my straight answer. No equivocation: CO2 is not to blame. Global warming and global cooling are overwhelmingly natural events. And of course, the anthropogenic portion of CO2 is only a very small part of the total CO2 emitted: click. That is all that I’m sure of. But the climate alarmists, including the UN/IPCC, Al Gore, James Hansen, Michael Mann, RealClimate, climateprogress, Tamino, etc., etc., appear to be certain that an increase in CO2 will trigger a “tipping point” leading to runaway global warming and climate catastrophe. That is the hypothesis [which they are afraid to argue in public]. We will eventually see who is right. And as usual, the goal posts are being moved by the alarmist contingent even as we discuss this. Recently we have seen some quiet backing away from the original conjecture that carbon dioxide is the main culprit — no doubt because the planet is proving the alarmists wrong. Time to take a stand yourself, Ben. Is CO2 the villain in the plot? Step up and be counted. No wishy-washy answer: will CO2 cause runaway global warming? Or not? If the snow were real, would that be the first time it snowed in Florida since “The day it snowed in Miami”? That’s a part of our weather lore of sorts down here, but I’m just curious how rare such a thing actually is. In my short life time and geographic experience, it has never happened-but obviously there is at least one case in history. Where does one find the bloody data on these things!?!?! And more to the point, if one can find the data, just how corrupted by hijinks like these might they be…? Did Al Gore visit Key West yesterday? The Hansen Mars challenge guy is wrong. There is lots more CO2 on Mars above every square meter of surface than 9 times that on Earth. The “sea level” (a datum has been defined) pressure on Mars is somewhere around 6 to 9 hPa, call it 7.5. 95% CO2 gives close enough to 7 for government work. But the gravity on Mars is only 0.38 that of Earth so to produce this pressure on Mars there must be 2.63 times the number of molecules so multiplying 7 by 2.63 gives 18.4 hPa if these molecules were in the Earth gravity field. On Earth the partial pressure of CO2 is around 600ppm times the mean surface sea level pressure or 0.6hPa. 18.4/0.6 is over 30. So not 9 times but 30 times as much CO2 over every square meter of Mars as on Earth. Mars is obviously suffering from a runaway greenhouse effect ……. isn’t it? Bruce Cobb re: Richard – EXACTLY! Many people do not know what “science” is, that it is a process, and that following that process, called “the scientific method” may lead to FACT, which is replicable every time if it is indeed true, or it may lead to yet un-proven “possibilities”. Well said, Bruce. Smokey re: Richard – great partial list of peer-reviewed articles/documents which provide many FACTS in opposition to AGW “possibles”, AKA “consensus”, as well as many unanswered questions. A repeat comment of my own: The entire controversy still depends on HOW THE EARTH’S TEMPERATURE IS DETERMINED! No one has answered that question to my satisfaction. We have geological and anthropomorphic historical evidence of warm periods and of ice ages, with much evidence revealing probable temperatures. We can believe with confidence that there have been periods of time when it was warmer than it is now. Current instruments for measuring land, oceans, various layers of our atmosphere vary in accuracy and, therefore, reliability, and they fail to cover the entire globe, so I cannot accept the conclusion of any entity that makes pronouncements and makes predictions about the “earth’s temperature”. The crisis is contrived by those whose objectives are power, money, and control, and they have been successful in duping well-meaning people all over the world who want to be good citizens and stewards of our planet. Unfortunately the consequences of the path we find ourselves on due to the AGW propoganda will affect every person on earth. Much scarier than “climate change”! First, from your CO2/Anthro component. Its interesting because if you take away the human component and then subtract the emitted from absorbed, what do you get? You see, the amount that is accumulating in the atmosphere each year is solely a function of humans. In other words, if we added no CO2 to the atmosphere, there would be no accumulation, and their may even be some decline. According to your table that is. What you are trying to do is to say, hey look at this big number and this little number, clearly humans could not effect CO2, those stupid warmists! Which is a really appealing, easy to undestand argument to make to the nonscientist. But to do that (and get away with it) you have to hope they don’t look at the the rest of the table. That is what you are doing isn’t it? Or do you really think that table helps your argument? Cause if you think that latter, I need some light shed on your thinking. I am sorry to disappoint you, but I rarely deal with absolutes in trying to predict highly chaotic systems with multiple variables. But my answer would be (and you will have to settle for) is that CO2 has the potential too. Should I clear away dry brush and timber from the side of my house since that material merely has the potential to burn my house down? Or should I just ignore it and hope for the best? I mean, it could rain tomorrow. There is no water vapor on mars. One thing that AGW proponents have to remember is that people who don’t support a hypothesis don’t have to prove anything so it’d be no surprise to see fewer papers sceptical of AGW. The onus for providing any credibility for a hypothesis is purely on those who promote it. There is no proof of AGW not even reasonable doubt. Regarding those who would believe that Carbon has the potential to cause climate tipping points? Relax, history shows that tipping points don’t exist. 30 times as much CO2 as Earth and no runaway warming. Yet you claim CO2 has the potential to cause runaway warming on Earth. Where are we going to get that much CO2 from? Got to be more than 30 times as much as at present. Water vapor feedback you say? It may be news to you but 2/3 of the planet is covered by water. The air above much of that isn’t that far from saturation already. How much more effect are you going to get? As for your poorly stated version of the precautionary principle, how much are you willing to spend to clear away the dry brush from the side of your house? What percentage of the value of the house? Make no mistake, reducing human CO2 production is going to cost the house and an arm and a leg. If you think differently you’ve bought a lie. If you start from a false premise like that, you will end up with a wrong conclusion. Unless, of course, you have a way to identify CO2 molecules produced by human activity, vs molecules produced by ocean outgassing due to natural temp declines. What you are trying to do is to say, hey look at this big number and this little number, clearly humans could not effect affect CO2, those stupid warmists! You’re pretty much on the money there, Ben. The onus for providing any credibility for a hypothesis is purely on those who promote it. Exactamundo. This can not be said often enough. Based on what? Nobody has answered my original question from yesterday morning: where is the published peer-reviewed research that proves this? Where is the peer-reviewed study that demonstrates the IPCC-asserted positive feedback mechanism between CO2 and water vapor? Where is the study that demonstrates that mankind’s contribution of CO2 to the atmosphere is a major driver of global climate? If the central CO2 assertion is not based on the scientific literature, why does everyone who believes it think they’re being scientific? Anyway, more warmth means more plant and animal life means more CO2. CO2 levels in the atmosphere have risen in the past in response to warm cycles for this reason. Why would you think it would be static this time, except for humans? Yesterday, it was 117 in Easton, MD, which would be the hottest day on record for the entire state. I saw this on both Weather.com and Accuweather.com so it has to be correct. It was 77 at 8 AM, 117 at 9 AM, and 82 at 10 AM. Obviously the result of global warming, and not some sensor malfunction. Funny, sure doesn’t feel like it’s snowing out here. Let me know if you need any on-site checks at the EYW airport. I live here and have some friends in CBP so it’s no problem to get to the runway area. Since you talk to me as if I am dumb, I will do the same! Clearly you don’t understand atmospheric thermodynamics! The amount of water vapor is a function of temperature. Care to quantify an arm and a leg? 1-2% GDP? Go back to your table and do a quick calculation. Take natural sources and subtract from that absorption and tell me what you get. So I will ask you, now that you have done your calculation. What percentage of the CO2 accumulating in the atmosphere is due to humans? Or to ask in a different way, how much CO2 would be accumulating in the atmosphere, if human sources were zero? Effect vs. Affect…doh! Forgive me Smokey, I was tired. Typically in science, the folks who are skeptical need to demonstrate why a particular idea is incorrect. As far as I know, I have not seen that done on the ‘skeptics’ side. You say it with authority so it must be true? Here is an interesting article. Figure 1 is illuminating. Thank you, I will go and have a read. No, it is those who make the assertion that they’ve discovered some new principle or mechanism who need to prove their case. The assertion being made is that CO2 is a major driver of global climate. Where is the peer-reviewed study that demonstrates that mechanism? What observations will confirm it, and what tests would disprove it? Without this, we’re calling BS on that assertion. It is up to those who believe that assertion to prove that there is anything unusual about the warming we’ve experienced, and it is up to those who believe that assertion to prove that the primary cause is mankind’s contribution of CO2 . In other words, this is simply a computer model-generated scare story. You would do well reading John Brignell’s column about the misuse of computer models, rather than that silly alarmist arm-waving nonsense that passes as science. I’m not going to convince you, Ben. You’re a True Believer in fairy tales like the tipping points and abrupt climate change, which are completely fabricated with computer models by grant-seeking alarmists sitting in their air conditioned offices. The basic fact that as CO2 has steadily risen while the temperature has been flat to declining for most of the past decade makes your purveyors of ‘abrupt climate change’ look increasingly silly. That whole article is junk, eh? For my master’s I used models extensively. I guess I will toss the whole thing out. Models are not absolutes Smokey, but they are very powerful tools. You’d do well to remember that, because if you want to discard all science that involves models, well, that’s about 98% of modern science. I’d advise you though, you might be taken more serious if you didn’t always have to fall back on the rhetoric with statements like “grant-seeking alarmist” ad nauseum. I mean, really, think about what you implying about the tens of thousands of scientist around the world. Do you honestly believe that they just keep pushing the idea of GW in an effort to get grant money? All of them across multiple governments and funding institutions? You stick with your decade of flat temps and if 10 years when if the temps are warmer than today, then what? Have some cake and eat it too I guess. But Smokey, it should be pretty easy question to answer, since you seem incapable, let me do it for you. -11,400 Million Metric Tons of annual accumulation. So with no human source, we have a net loss, with a human source, we have a gain of 11,700. So again, what percentage of annual accumulation of CO2 in the atmosphere can be attributed to humans Smokey? Remember, this is a link you provided in an effort to try and prove the point that humans have little contribution (although it seems a completely opposite point is made). 1. Computer models are like video games, worthless. 5. Its cold in January in the Northern Hemisphere. 6. Al Gore is a douche, so is that Hansen guy, therefore there is no such thing as climate change. You certainly have the easier job since people (in general) are scientifically illiterate. I mean, 1/2 the US thinks we did not evolve. I should really read my post before I hit submit. I know Smokey, you will be quick to jump all over those. Cause a grammatical/spelling typo undermines an entire post, amirite? P.S. Smokey, what caused the warming from 1880 to today? Just curious. Maybe just “natural variations” that don’t need an explanation of mechanism? Benjamin P. (10:29:40) : Maybe indeed. Now prove it wasn’t. The rest of what you’ve posted is so clueless and laughable I won’t even bother. You refuse to do mathematics. Therefore, you are doomed to talk nonsense. Sorry to get you wound up so tight, Ben. But three posts in 15 minutes indicates way too much emotion; you’re not thinking straight. Listing your seven points, every one of which misrepresents my position, doesn’t help. I’m used to people trying to re-frame my argument into their strawman, so things like that don’t easily get by. I understand that you are a True Believer in CO2=AGW. The conjecture is wrong, but lots of people still believe in it. Lots of folks believe in Scientology, too. Show me solid evidence that rises in CO2 precede rises in temperature. There’s plenty of evidence of the reverse. Show me solid evidence [nothing generated by computer models; only real world evidence, please] that CO2 causes measurable global warming. Where were the measurements done? And how were they done? By whom? And are the results publicly archived — or are we expected to trust them? Show me solid evidence that CO2 is any less beneficial or necessary to life than H2O, or that CO2 in trace amounts is harmful in any way. Show me that the sea level is gonna get Micronesia, Florida or anywhere else. Show me that the current rate of increase is substantially more than it was before the industrial revolution. Show me that the planet’s glaciers are receding [I really hope you take the bait on this one]. Explain how the Wilkins ice shelf is breaking off, if it is receding instead of growing? Show me that mysterious climate “tipping point,” and identify where it is. Show me. Otherwise, it’s rank speculation based on nothing but always-inaccurate models. Show me that elusive “heat in the pipeline.” Where is it lurking? Show me why GISS and NOAA “adjust” raw temps almost exclusively upward. Explain AGW climate catastrophe in a way that a skeptic can understand it — keeping in mind that current temperatures are no higher than they were thirty years ago. How does that work? Global warming causes global cooling? Show me a single GCM that predicted this past winter’s unusually severe N.H. winter. Show me solid evidence that anything blamed on CO2 by the AGW crowd is legitimate, according to the Scientific Method. So far, every item above has either been debunked, or is still up in the air because we do not have enough information. Most of those alarming scenarios were easily discredited. That’s why we don’t hear about them any more, except on incredible sites like the agenda-based RealClimate. Ozone hole? Pf-f-f-ft. Coral bleaching? Pf-f-f-ft. Ocean acidification? Pf-f-f-ft. In fact, all of the AGW hype is built on a house of cards. The central scam is that CO2 will cause runaway global warming and climate catastrophe, and it is all based on computer models that were programmed by the same people who stand to benefit if CO2 is labeled a pollutant. So I look with a skeptic’s eye at any system that can be gamed. And GCMs are easily gamed. As is the current climate peer-review system. What astonishes me is the ease with which some folks [who have convinced themselves that they are open minded and rational] accept what amounts to nothing more than personal opinion… as verifiable scientific fact! Karl Popper would blow a gasket. I’ll listen to solid, reproducible evidence — but not to rent-seeking authors angling for a handout [like your pnas link], or to computer model conclusions, or to the agenda-based opinions of the IPCC political appointees. Make it empirical, falsifiable evidence, and I’ll sit up straight and pay attention. I doubt I’ll have to respond, though, because all those things have failed to meet the criteria of the Scientific Method, every one of them. So you’ll get the last word in here. But you never know, you might be the next Einstein. Give me solid, real world, reproducible, falsifiable evidence, and you may even convince me to change my mind. We must have Gored Ben’s ox. So what was your Masters in, Ben? One of the social “sciences” ? The pretty obvious point being made about CO2 is that it is having all the effect it is ever going to have. Planet Earth’ climate is driven by water. The energy source is the Sun. Pity for you there’s no evidence of the water vapor feedback you claim. In fact the evidence is to the contrary which you would know if you had spent any time here. Then again there may be no significant warming (see the surface stations project of Anthony’s) which may be the reason for the lack of observed water vapor feedback. Or the tropics may really be the temperature regulator for Earth. If you are going to make stupid posts, people here will answer as if you are stupid. You are doing well at that so far. Apparently you do not read much Published Science. I have read a number of papers where they do a very nice job of collecting, collating, analyzing, and interpreting data in a way that disagrees with the CONSENSUS. Then, in the Conclusion, there is the mandatory statement that this paper does NOT disagree with the Consensus and they need more money to help stave of AGW!!! You should also remember that there ARE straight forward papers that DO disagree with important areas of AGW. I am sure Lindzen, Spencer, and a number of others would be interested in your idea of a dearth of published science that disagrees with the Consensus. Steve McI at Climate Audit has published destroying the Hockey Stick for instance. By the way, have you been counting the number of Scientists that have retired in the last couple of years and come out AGAINST the Consensus??? Apparently fear for job safety and financial security really DO keep mouths closed. Nice contribution to the discussion! Smokey, was really just one post, with a grammatical correction and an after thought. Honestly, I am feeling quite relaxed. But I will just hold my response because it will not be productive. It’d be a big time investment for me to dig around, get my sources in order and provide the things you want, only to have it met with you saying “Click” to a decades worth of data or some rant about a computer model. There are plenty of papers out there Smokey, and I’d imagine you’ve read your fair share of them. I will just keep believing my “fairy tales” and you can keep posting your decades worth of data. Sorry to not entertain you! You seem like a swell chap (not?). My master’s is in geology, specifically looking at the chemistry of subduction zone volcanic rocks. Is this a stupid post too? Oh, and Mike, here is a quick read for you. Don’t trust them though, they just want some grant money. I would suggest you might also want to extend that injunction to the comments and positions of those you want to respond to. The sorry seven list of positions you claim we all promote indicates to me that you are either intellectually incapable of understanding or have willfully chosen not to understand what is going on here. I would first point out that that notion didn’t achieve wide currency here until a large mountain of adhom accusations of “oil industry shill” had accumulated in the contrary sphere. All scientists, even those rare few for which science is the purest if altruistic quests, unless they are blessed with inherited wealth, require funding, It’s hard to finance meaningful experimentation with altruism. I have seen a fair amount of anecdotal evidence that funding and publication decisions in climate science are subject to a bias against those who challenge the prevailing agenda. You may disagree. We’ll let that go. Perhaps you can point me to a significant database, related to climate science, in which a majority of the data points are actual measurements. Some data points? Any? You may see nothing questionable in the apparent similarity in the shape of the GISS temp graph and shape of their overall adjustments graph, but I myself find it curious. .5. Its cold in January in the Northern Hemisphere. You should be willing to cut us all a bit of slack for our linguistic confusion, since the semantic legerdemain driving it originates almost exclusively from across the aisle. BTW, I wish you’d elaborate on your ending parenthetical, which strikes me as a distinction without a difference. Maybe you could help me out. I’ve been looking for a source of information on the contribution of sea floor volcanism to the oceanic heat budget and, since your specialty is related, I wonder If you could point me in the right direction? Excellent post @16:45:58. I was tempted to respond like you did, but I got carried away with my questions. Too bad Ben ducked them. Ben’s answer: “But I will just hold my response because it will not be productive” is, of course, a complete cop out. That’s how alarmists generally deal with inconvenient questions from skeptics. Trying to actually answer the questions throws their Cognitive Dissonance into high gear. It’s much easier and more comfortable to just wave away any serious questions. And you’ve contributed, what, strawmen and whining? BTW Dessler writes for the left-wing Envrionmentalist website Grist, so, while we are at it, he is politically biased, too. But you seem to make a good point. SEEM TO. Namely that one can’t dismiss conclusions of scientists by questioning their motives. EXCEPT that’s exactly what warmers do when it comes to every finding which reduces alarm. MOREOVER you continue to confuse the trivial with the serious. An inability to distinguish between substantive issues and unimportant matters gets you an F in Respectability. AND you neglect the NON agenda arguments AGAINST alarm in favor of continuing to use your argument-from-ridicule “HAHA CONSPIRACY NUTTERS” tactic-Hey, what do you know, Alinsky lives!-But I don’t think I’m going to waste anymore time on a rocks for jocks reject and I don’t think anyone else should either-not because your stupid (although you seem to want to encourage that image) but because you are so bloody thick there is no hope of getting you to understand-you don’t want to. We’ve led you to water, but we can’t make you drink. Yes, you can lead a goron to water, but you can’t make him think. Okay, admittedly, much of my post was not productive. Too much snarc, nothing useful. I appreciate your response. A word about oil money. My undergrad geology department would not be around if it was not for oil companies, and never have I laid a claim that “skeptics” are in it for money from the oil companies. As for a paper on heat flow, here you go…. Smokey, even if I were an expert that’s a hell of a task wouldn’t you say? And look at the responses i’ve had all along? Its futility! I will trust you’ve looked at the data, you’ve digested it, and you’ve made your conclusions. You can trust i’ve done the same. So we disagree, you at least have managed to be mostly respectful during our conversation. Less could be said of others…. Rocks for jocks reject, eh? Are you a [snip] in real life, or does it just come out from the anonymity of the internet? Here is another paper, which might be better.